Spokane architect George Melville Rasque was one of the most prolific architects of the Inland Northwest and his legacy can be found in countless communities across eastern Washington. Rasque was born August 13, 1891 in Boscobel, Wisconsin and spent just two short years training at the Bradley Polytechnic Institute in Peoria, Illinois; a school founded on the principle of teaching practical skills. Prior to coming to Spokane in 1922, Rasque had been a carpenter in Rapid City, South Dakota and later served as a manual training teacher at the Indian school in Jocko, Montana. Upon his arrival in Spokane he first took a job as a draftsman for the National Builders Bureau (1922-23), and then became a detailer for the Spokane Sash & Door Co. (1923-24). Further experience was gained by serving as a draftsman for architect G.A. Pehrson (1924-25). While there he gained his state architectural license (No. L48, 1924) and with a variety of experience at hand Rasque formed a partnership in Spokane with well-known Montana architect, John G. Link in 1925. The firm of Link & Rasque only lasted a year before Link returned to Montana, however by then Rasque had gained the confidence he needed to establish his own firm. Reportedly joining him was noted draftsman Arthur Sackville-West. Sackville-West had worked for many years for a variety of other Spokane architects, including Kirtland Cutter and the firm of Whitehouse & Price, but never actually became a full partner of the Rasque firm. Soon Rasque began to specialize in educational facilities and over the course of his career he designed over 60 school buildings throughout eastern Washington, Oregon, Idaho, and Montana. Many of these were additions to existing schools, which were necessitated by the post WWII baby boom. Projects included additions to Finch (1947), Willard (1950), Whittier (1950), Columbia (1950), Emerson (1950), Trent (1952), and Roosevelt School (1953) all in Spokane. He also designed the Lewis & Clark High School Fieldhouse (1940); Mead High School (1926 and remodel 1961); and grade schools in Lapwai (1941), Colville (1948), Ritzville (1950), Newport (1952) and Colfax (1952) to name a few. He also designed Ephrata High School (1932); and Eastern Washington College’s Elementary School (1959), which received a National Award for School Design. 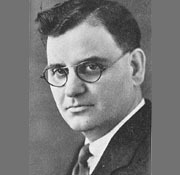 Rasque's son, George William "Dutch", joined the firm in 1938 after his graduation from Washington State University. The firm then became known as George M. Rasque & Son. George Jr. was drafted during WWII and died in the Battle of Okinawa near the end of the war. However Rasque retained the name of George Rasque & Son until 1964 when he promoted his long-time draftsmen Jack Sackville-West (the son of Rasque's former draftsman Arthur Sackville-West) and Edward Strang to associates. The firm was then renamed George Rasque & Associates. Eventually when Rasque retired, Sackville-West bought the firm. During his long career, Rasque became one of the best-known architects in the state. And with his many public building projects in the eastern portion of the state, he held the unofficial title of “State Architect” for Eastern Washington. Rasque had developed a close friendship to Governor Clarence D. Martin, a Cheney native son who served as governor from 1933 to 1941. Due to this relationship, he most likely was awarded several important state projects including numerous buildings at the State Penitentiary in Walla Walla and at Eastern State Hospital in Medical Lake. Rasque was known to have deliberately under-bid other firms in order to secure design contracts. He was fond of telling young draftsmen what he considered to be the three most important rules for practicing architecture, “1) Get the job; 2) Get the job; and 3) Get the job. You can't do good architecture unless you get the job." Among his public projects were numerous buildings on the campus of Eastern Washington University (EWU) in Cheney; and county courthouses for Benton (1926) and Ferry (1936) counties. Other notable projects included the REA Offices (1949) in Davenport, Spokane, Lewiston and Sandpoint; the Barton Auto Co. Garage (1948) in Spokane; the VA Hospital (1947 with John Graham) in Spokane; and the Crick Medical Center (1945) also in Spokane. While not his primary focus, Rasque did some residential designs scattered throughout Spokane and the surrounding communities. These included the Brazeau and Bankson Houses in Millwood; and the Dr. Corbett and Danson-Chase Houses in Spokane. Near the end of his career, feeling indebted to the university in Cheney, Rasque established a scholarship fund for needy students at the University. The fund, a memorial to his lost son, was to be financed via the income from a dairy farm he purchased near Chattaroy in northeastern Spokane County. Unfortunately the farm proved unprofitable; nevertheless, however many students attended EWU and Washington State University on scholarships Rasque funded directly from his architectural practice. On the professional side Rasque was a longtime member (16+ years) of the State Board of Architectural examiners and eventually became the chair in 1946. He died in Spokane on October 20, 1977 at the age of 86. Rasque's firm lives on today at the Cortner Architectural Company.